The annual Pebble Beach classic car show is mostly about high-end collectible automobiles. (For instance, how about the Ferrari convertible that sold for $27.5 million?) But, with all those wealthy car fans jammed into such a small area, where the average traffic jam has a net worth greater than many small nations, automakers have taken to revealing their latest pricey wares there as well. These are the cars that could be selling for big money in decades ahead. 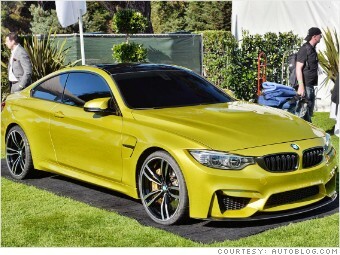 For instance, BMW unveiled a close-to-production concept version of its upcoming M4 high-performance coupe. Finished in eye-catching, if slightly weird, "aurum dust," this car offers a preview of BMW's replacement for the M3 coupe.